Sonnet's Tempo SATA Express 34 ushers in a new level of higher disk performance capability for the mobile professional. Whether you capture and edit video content in the field, the studio, or home, Tempo SATA Express 34 sets the bar high for mobile storage products. 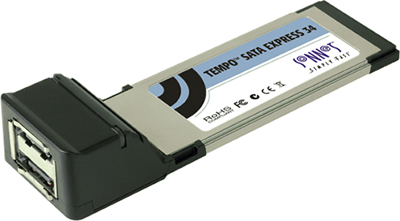 The Tempo SATA Express 34 controller has two external, 3Gb/s, SATA II ports, and plugs directly into a MacBook Pro (15" or 17") or Windows notebooks with an ExpressCard/54 or ExpressCard/34 slot. Imagine connecting up to 10 drives (1)(2) for high-performance applications, such as Apple's Final Cut Pro. With two external SATA drives attached in a RAID 0 array, the Tempo SATA Express 34 can support sustained write and read data transfer speeds of 100 and 110 MB/sec, respectively, which is about three times as fast as USB 2.0 or FireWire connections to the same drive setup. Offering native SATA speed in a compact mobile package, Sonnet's Tempo SATA Express 34 redefines the definition of disk speed for the creative person on-the-go.